FRANCES DINKELSPIEL is an award-winning journalist and the author of Towers of Gold: How One Jewish Immigrant Named Isaias Hellman Created California. Towers of Gold was a San Francisco Chronicle bestseller and named a Best Book of the Year by the Chronicle and the Northern California Independent Booksellers Association. She is the co-founder of the news site Berkeleyside and her work has appeared in The New York Times, Wall Street Journal, Los Angeles Times, People, San Francisco Magazine, and other venues. She lives in Berkeley, California. 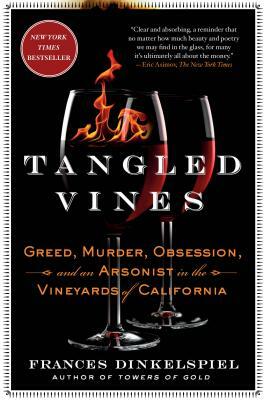 "Dinkelspiel’s stunning new look at the dark side of California wine, you won’t want to get up until you’ve devoured the entire book... [An] uncommon page-turner. Dinkelspiel has woven skillfully three distinct yet inextricable narratives into a book that will inform and fascinate readers for years to come. While the stories she tells are engrossing on their own, it is her steady journalistic tone, backed by prodigious and painstaking research, that gives this book its power and allure." - Berkeleyside's "Nosh Weekly"
“History, wine and crime intertwine in this fascinating page-turner. Dinkelspiel travels in time to create a dark and deep portrait of three centuries of California wine culture.” —Davia Nelson of NPR’s "Kitchen Sisters"